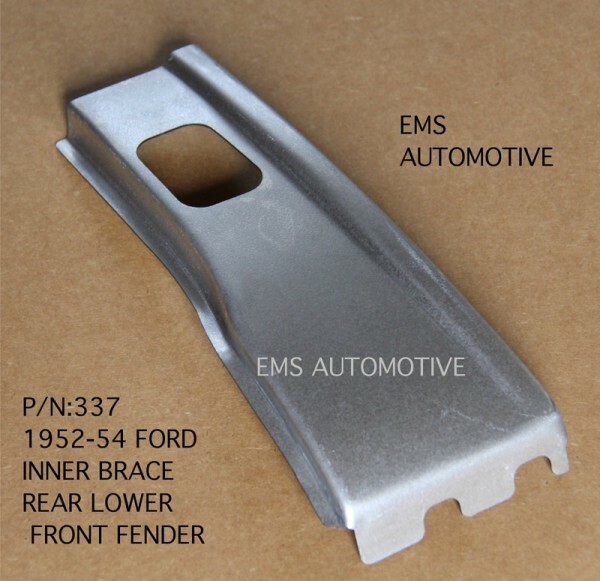 THIS HIGH QUALITY LOWER INNER FRONT FENDER SECTION FOR THE 1952/54 FORD CARS IS THE CORRECT SOLUTION FOR THOSE RUSTY FENDERS. DIE STAMPED FROM 18 GAGE STEEL, USA MADE, REPAIRS THE INNER BRACE AOF THE FRONT FENDER BEHIND THE WHEEL OPENING, THESE FENDERS ARE NEARLY IMPOSSABLE TO FIND WITHOUT RUST. AND THE INNER BRACE WILL MAKE FOR A GREAT REPAIR OF THE LOWER FENDER AREA.